Join some fiddle twiddling, knee slapping yokels for a trip deep into the earth for treasure. The best part is you don’t even need to leave the couch to do it. Impossible? Well, not with the Gold Diggers slot from BetSoft. This title is typically strong visually for a company who offer some of the best-looking games in the industry. It’s not just a great on the eyes though. Gold Diggers also has some memorable side games, and enough features to keep players coming back for repeat visits. Great art style. The animation department at BetSoft have scored another homerun with Gold Diggers. The cutscene sequences are particularly entertaining. Fun bonus features that can be potentially lucrative. We’re a big fan of second screen side games, and the one on Gold Diggers is great. Low upper betting limit. This is a problem common on most BetSoft machines but is still worthy of mention. Small main game jackpots. Fortunately, the title’s bonus features somewhat make up for this disadvantage. Bearded prospector = 500x the line bet. Slim prospector = 400x the line bet. Woman = 300x the line bet. Dynamite = 200x the line bet. Landing three or more dynamite symbols in a winning combination on an active pay line will cause them to explode. After the first pay-out is made, the symbols will blow up. This will cause those above to fall into view, offering more chances to win. Landing three or more gopher symbols in a winning combination on any active pay line will trigger the “Gopher a Dig” click me feature. Players must choose the click me symbols shown on screen to dig to bonus credits. Landing three or more “Gold Rush” poster symbols in any positions will trigger the Gold Rush Bonus game. 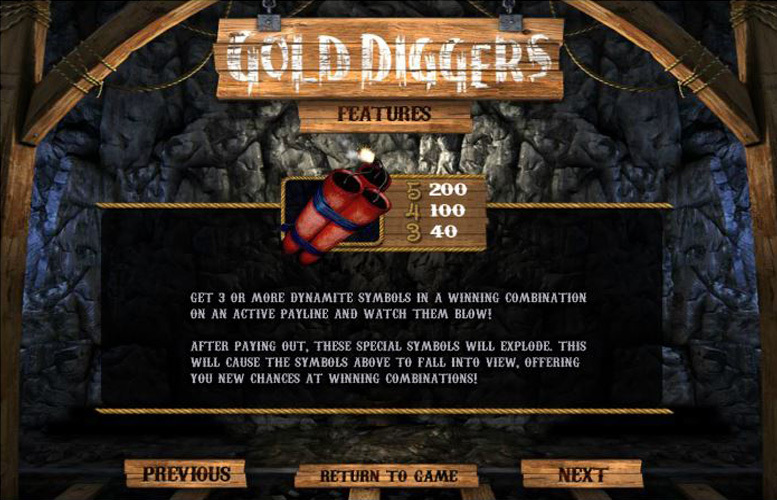 Players must help the miners to strike it rich by finding the gold hidden behind the rocks. This awards bonus credits. Oil barrels = 150x the line bet. Lamp =125x the line bet. Cart = 100x the line bet. Pick axe = 75x the line bet. Gold shards = 50x the line bet. Gopher = 30x the line bet. 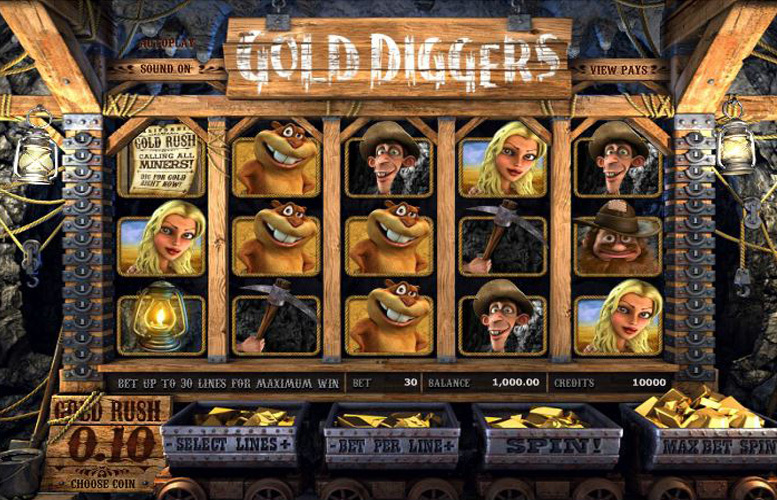 Players are given maximum choice over where their money goes on Gold Diggers. There are options to alter the number of win lines played (between one and 30), and the number of coins bet on each one (between one and five). They can also choose the value of each of these coins. The highest here is 50p, and the lowest, 2p. This means that with all the values set to the minimum, the smallest possible cost per spin is just 2p, meanwhile, the highest is a wholly underwhelming £75. This is small even by BetSoft’s standards, and they are known for their restrictive betting limits. 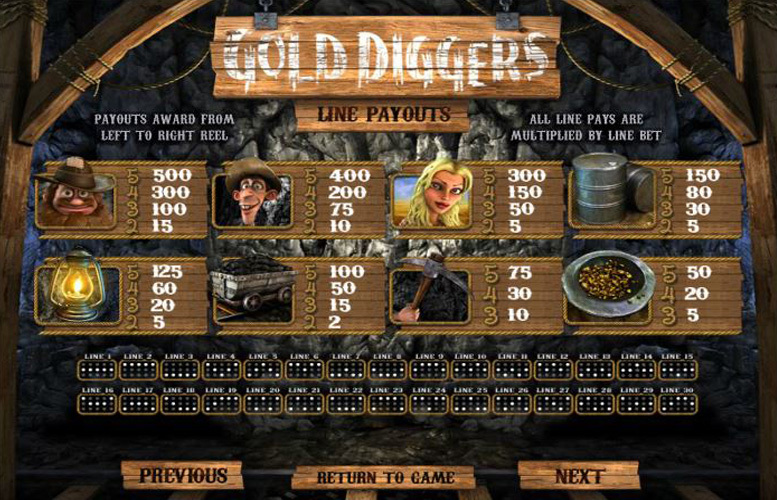 The Gold Diggers slot is a lot of fun thanks to its diverse and varied side games and bonus features. It also looks amazing with slick animated cut-scenes, and great moving symbols when wins are awarded. Players who like their slots to look the part, as well as playing well can do much worse than taking a few spins on this title. All that said, there are a few drawbacks. These are consistent with all BetSoft title’s, even their best. Firstly, the low upper betting limit will likely put the highest rollers off from giving it a try. Also, the main game jackpots are a bit of a let-down. Fortunately, the game does seem to trigger bonus stages rather often. However, players should note the low RTP rating on Gold Diggers. This game has a rating of 4 / 5 with 410 total reviews by the users.